DSA LightCycle Full Keyset Group Buy Live! 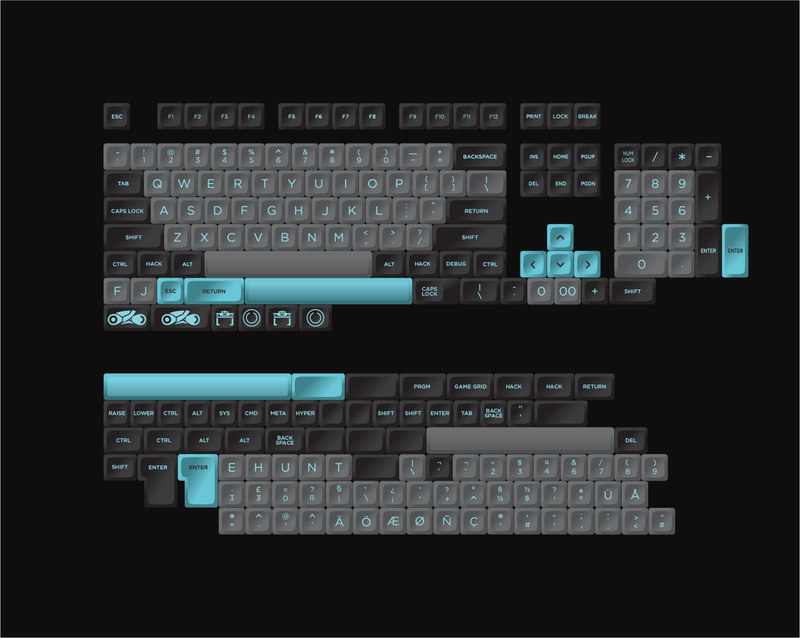 I'd like to announce that the DSA LightCycle FULL keycap set is now available for pre-order. With all the feedback to expand the set to a full keyboard I spent a lot of time working with the community to do just that. The full set offers compatibility for a wide range of layouts in both mx and alps stems. The set is broken up into a base tkl set, numpad, and compatibility/international. This is a rare opportunity to get a full alps set with international support. LightCycle sports Tron themed novelties and colors in double shot DSA profile. The homing keys are the center bump variety. only ALPS? bummer. Although this set looks sick! You're the man dude! I've been waiting for these forever! Not the same with the grey, but it is still soooo nice! Dude, why'd they cancel my order?? bummer. Evan, thanks for replying to my email. Guys, if your order was canceled, the details as to why are on Evan's website. http://bit.ly/2eELIns Evan dude, if you're planning to launch this again, just letting you know that I'm SO IN. And thank you for refunding us properly. Thank you Makami. I kind of forgot to check his website when I found out. I guess my brain cells just shorted and couldn't process that LightCycle was being canceled. any extras will be available for sale after all the pre-orders go out. for an ergodox I need 4 vertical 1.5u keys (seeing none) and 4 vertical 2u keys (seeing only 3), but with DSA-profile I could use 90° rotated horizontals ? rotating the 2u's should also work ? or problematic because of stabilizers ? edit: mmh, rotation doesn' t work an alps/matias, real vertical keys 1.5u and 2u needed. The holes for the switches for the vertical keys are 90° rotated. So the horizontal keycaps (2u & 1.5u) should work for the rotated switches the get vertical keys. I have a question. How come this set will get to us at the latest, after doing some math, at the end of December 2016? That's so freaking fast compared to other sets I've picked up from Massdrop via Signature Plastics. Is it because when sets are sold on Massdrop they include so many options and possibly a lot more purchases? IDK. I'm asking to try and understand the logistics behind why it seems to be so much faster to receive this set ordered this way rather than through Massdrop. Thanks. I'll understand if your answer is somewhat vague. lol. By the by, I'm definitely picking this up. The price and colorway is effing awesome imo. Thanks for bringing this one to us. I was a little bummed to see the only offered during the Van drop was the orange. A lot of it, from what I understand, has to do with profile. The SP drops on MD as of late have all been SA, and so there is a large backlog. The backlog is not as long on DSA. Will it fit my novatouch ? do you ship to VN too? Will these be shine-through for lit switches? Please put the words HACK, PRGM, DEBUG and GAME GRID on 1U caps too please. The page says there's support for ergodox layout, but I don't see an ergodox option. Which set should I choose for the ergodox? The Compatibility set includes support for the Ergodox. Will they work with the Corsair 75 RGB? This will work on a KBP v60, correct? It definitely appears that it does, I just want to confirm before signing onto the pre order. The v60 has a standard layout, so yes. Is the spacebar row Corsair K95 compatible? Is there a higher rez image available? am i to assume that the child kit will support Dvorak? Why would you need the child kit for Dvorak? i.e. as with DSA all keys have the same profile, you can simply swap around the QWERTY keys? Only difference would be the extra sculpted F/J keys that should become U/H. Are the U/H in the child kit provided for that purpose (and thus extra sculpted) ? Is there any other reason why you'd want the child kit for Dvorak? He only reason to get the compat kit for Dvorak Is for the homing keys. If you don't care about homing keys you can get by without it. Will this work for the WhiteFox?